OH WHAT A NIGHT! 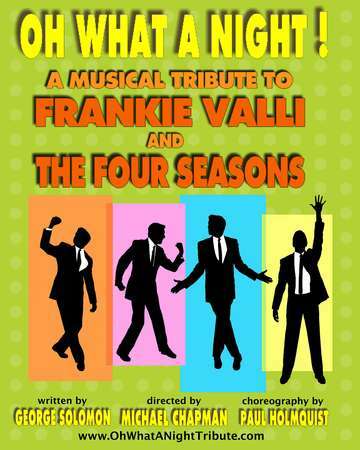 is an exciting musical revue show which features songs such as, Sherry, Big Girls Don’t Cry, Walk Like a Man, Can’t Take My Eyes Off You, My Eyes Adored You, Let Hang On and Who Loves You along with many more hits from the dynamic songbook of those boys from Jersey, Frankie Valli & The Four Seasons. OH WHAT A NIGHT! stays true to the original recordings and their interpretation of these classic hits are so true to the original recordings, that it must be pointed out that the cast really is singing live. This exhilarating show has been thrilling audiences with great choreography, boundless energy, and humor.